To the Rescue 'Dogs' currently is the only book written and developed to assist owners to help adopted, rescue or re-homed dogs suffering from separation distress including destructiveness, inappropriate urination and defecation (and fear-associated aggression directed towards strangers and other dogs) while appearing to be stressed and unsettled. 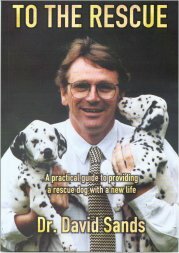 To The Rescue is intended as a practical guide for anyone who has or is thinking of taking on a rescue or re-homed dog. The guide is a much needed source of helpful and expert information. The book has been previously available for £12 (payable to Dr David Sands).